Discussion in 'Architecture & Engineering' started by Scottish Scientist, Apr 24, 2015. Design for the biggest-ever pumped-storage hydro-scheme. The scheme requires a massive dam about 300 metres high and 2,000 metres long to impound about 4.4 billion metres-cubed of water in the upper glen of the River Findhorn. The surface elevation of the reservoir so impounded would be as much as 650 metres when full and the surface area would be as much as 40 square-kilometres. The maximum potential energy which could be stored by such a scheme is colossal – about 6800 Gigawatt-hours – or 280 Gigawatt-days. There would need to be two pumping stations at different locations – one by the sea at Inverness which pumps sea-water uphill via pressurised pipes to 300 metres of elevation to a water well head which feeds an unpressurised canal in which water flows to and from the other pumping station at the base of the dam which pumps water up into the reservoir impounded by the dam. To fill or empty the reservoir in a day would require a flow rate of 51,000 metres-cubed per second, the equivalent of the discharge flow from the Congo River, only surpassed by the Amazon! The power capacity emptying at such a flow rate could be equally colossal. When nearly empty and powering only the lower turbines by the sea, then about 132 GW could be produced. When nearly full and the upper turbines at the base of the dam fully powered too then about 264 GW could be produced. This represents many times more power and energy-storage capacity than is needed to serve all of Britain’s electrical grid storage needs for backing-up and balancing intermittent renewable-energy electricity generators, such as wind turbines and solar photovoltaic arrays for the foreseeable future, opening up the possibility to provide grid energy storage services to Europe as well. The empirical Manning formula relates the properties, such as volume rate, gradient, velocity and depth of a one-directional steady-state water flow in a canal. For 2-way flow, the canal must support the gradient in both directions and contain the stationary water at a height to allow for efficient starting and stopping of the flow. Canal width – adding the 30km-2-way-wider-by value to the static-width determines the maximum design width of the water surface. 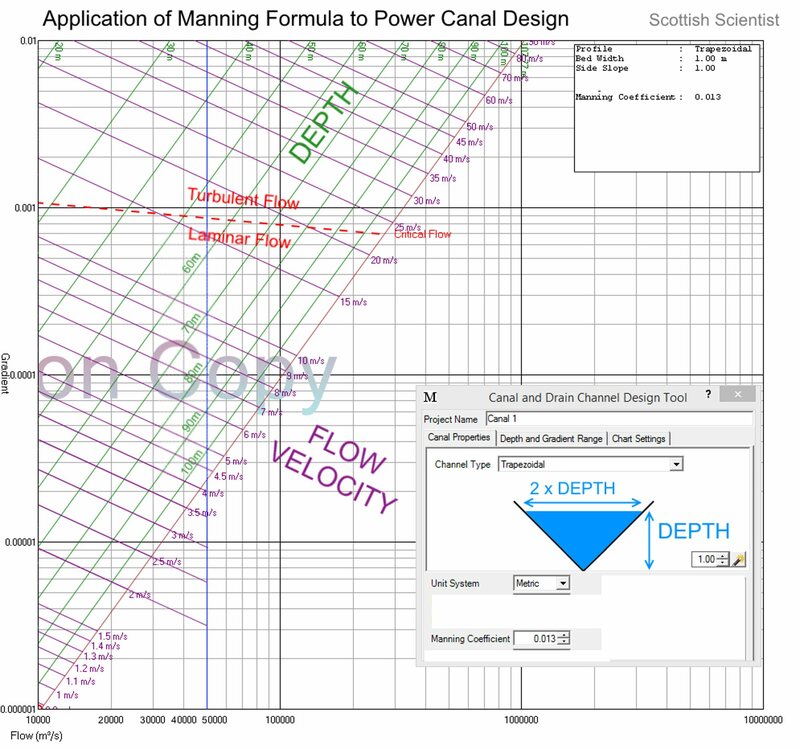 predicts a minimum value for the canal width of about 170 metres (plus whatever additional above the waterline freeboard width is added to complete the design of the canal) at a design maximum flow velocity between 10 and 11 metres per second. Guinness World Records states that the widest canal in the world is the Cape Cod Canal which is “only” 165 metres wide. So the canal, too, would be the biggest ever! To maximise the water flow velocity, canals are lined to slow erosion. Concrete is one lining material often used to allow for the highest water flow velocities, though engineering guidelines commonly recommend designing for significantly slower maximum flow velocities than 10 m/s, even with concrete lining. 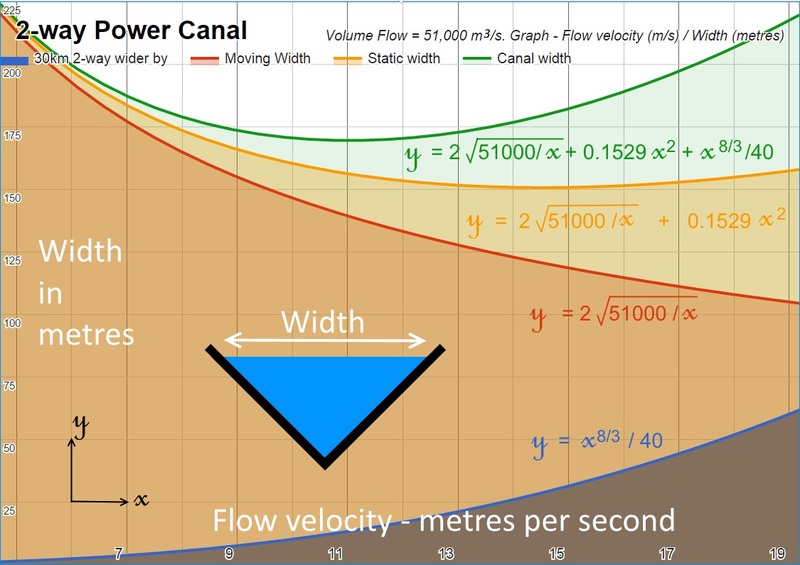 Designing for a slower maximum flow velocity requires a wider canal to maintain the maximum volume flow rate and is expensive in construction costs. Water flowing at 10 m/s has the power to drag large – in excess of 10 tonnes – boulders along the bottom of a canal with the potential of eroding even concrete, so I suggest that the bottom 6 metres width of the lining, (3 m either side of the corner of the V) may be specially armoured with an even tougher lining material than concrete and/or include bottom transverse barriers of 2 metres depth to impede the flow along the corner of the V and trap boulders, smaller stones and gravel, in which case the water flow is more precisely modelled for Manning formula calculations as a trapezoidal canal with a bed width equal to the 4 metre width of the top of bottom transverse barrier (“boulder trap”) and a 2-metre smaller depth from the top of the boulder trap to the water surface. The image shows the location of the main dam at latitude 57°15’16.2″N, decimal 57.254501°, longitude 4°05’25.8″W, decimal -4.090506°. 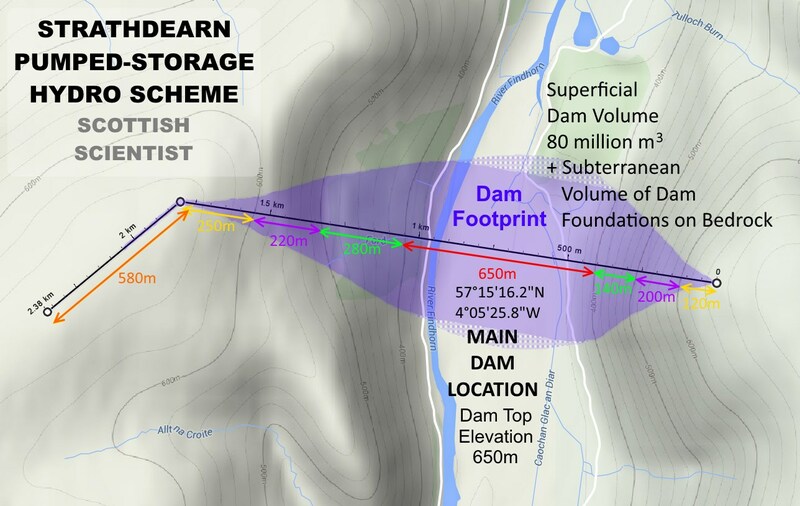 Assuming the dam would be twice as wide as its height below the dam top elevation of 650 metres, the superficial volume is estimated at 80 million cubic metres, not including the subterranean dam foundations which would be built on the bedrock after clearing away the fluvial sediment. How does it compare to Australia's Snowy River hydro scheme that took 23 years or so to build and which was finished in 1974. Well the main difference is that my plan is just a plan whereas the Australians have actually built the Snowy Hydro-electric and Irrigation scheme. Another important difference is my plan isn't for irrigation - it uses sea water which would kill off any crops it was used to water! The Snowy River hydro scheme is a conventional hydro-scheme where the water with the hydro-electrically-useful height is collected from rain falling on high ground. My plan for Strathdearn is to build a pumped-storage hydro scheme where the sea water has to be pumped uphill from the sea using up electrical power so as to give the water hydro-electrically useful height. Other concern is the NIMBY problem if there are communities, which might have valid concern with salt water infiltration of their wells / drinking water. * Economic feasibility is as important as technical feasibility. - This is something those planning to "mine asteroids" for minerals found on earth tend to forget. I've estimated a cost-per-GWh of 800 / 30 = £26.7 million per GWh. Using that factor, I've calculated an estimated cost for my plan for a 6800 GWh scheme to be 6800 x 26.7 = £181 billion. my modelling indicated to me that assuming particular relative costs of wind turbines versus pumped-storage hydro, a suitable size of pumped-storage hydro scheme to build would be 1.11 peak-demand days (the peak demand which was intended to be served from intermittent renewable power which the PSH scheme is balancing and backing-up). So working back from this scheme of 280 GW-days, I reckon such an energy storage capacity could balance and back-up 280/1.11 = 252 GW of peak intermittent renewable power. My modelling also indicated that the maximum of intermittent renewable generating power capacity which would be required to meet a particular peak demand would be 5.5 times the peak demand. So a peak power demand of 252 GW would could be met from 5.5 x 252 = 1390 GW of maximum intermittent renewable power capacity backed-up by 280 GW-days of PSH. - which would use up only 213/1390 = 15% of the balancing and backing-up capacity of this scheme. So this "biggest-ever" scheme could meet all of Europe's future needs for balancing and backing up intermittent renewables even when intermittent renewable power generating capacity grows to more than 6 times what it is today. Sure, because it would be a mighty hydro-scheme for anyone's back yard. Generous compensation payment terms for all dislocation and inconvenience could smooth the way though. But any water loss from the scheme is bad for efficiency and worse for unintended hydraulic fracturing. So every thought must be put into the design of the reservoir and canal to prevent water seeping out. I wish to remind myself for my next post that a 30-minute time limit on editing posts has been imposed. That may be an underestimate as you have considerable longer and more complex canal system between your two water basins, but I don't know how much of an underestimate it is because I don't know the fraction of your total cost that the open surface V-shaped canal represents. 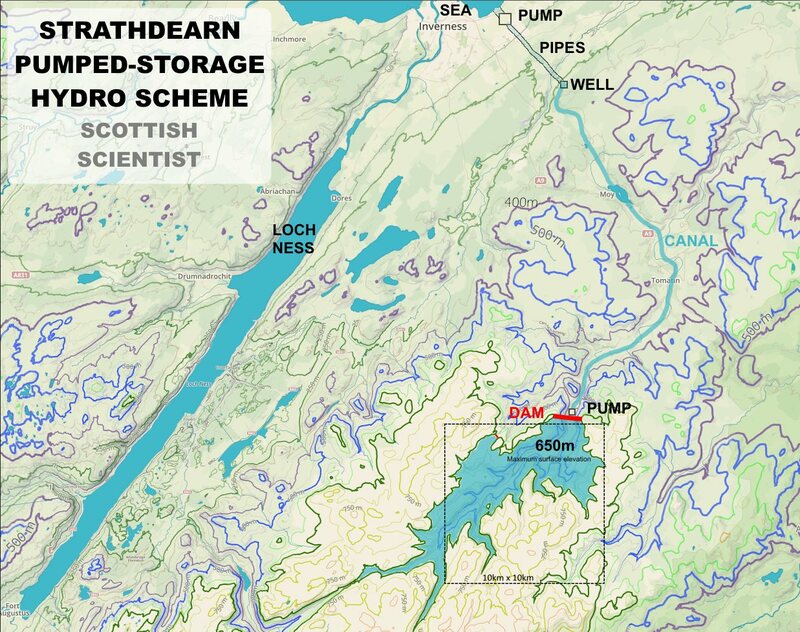 "The proposed scheme involves constructing a dam and the creation of a new reservoir formed at Loch a' Choire Ghlais. Water will be transferred between the new reservoir and an underground cavern power station via a headrace tunnel; and between the power station and Loch Lochy via a tailrace tunnel." Also note Your single V-shaped transfer canal is two way flow, with small gravity gradient to drive the flow whereas their scheme has essentially full gravity dropping the water down to the never reversing generator turbine. I'm not sure, but strongly suspect that a turbine generator that can run either way must be less efficient than one that can be at times a power driven pump, lifting water and at other times at water driven generator producing electric power. However, I'm not sure they don't reverse their pump generator too. Then there is a scaling question: The linear dimensions (height, width & thickness) of your dam are all greater. The cost of concrete will go sort as the cube of some scale factor, not linearly. Finally, you did not give any clear answerer to my basic question: How may years until "breakeven"? To a small extent, this will depend on the length of the power transmission line which delivers the power to a major load centers. Your power lines will be much longer as you speak of serving main land Europe too. There is a reason why power companies build many smaller facilities near load center, and not one in Kansas, to serve all of the US. E. g. Your system may be too grand in scale. I would not be surprised if the correct answer to my question is: Never, at least if the interest on the borrowed capital is at 6%. I'm not trying to "rain on your parade" - Just save you more effort, if the concept is not economically viable. You have already done a lot of analysis - switching to doing more economic analysis would be wise, I think. BTW, I think you can edit a post for 90, not 30, minutes, but not sure. Even that is not enough for me some times. I am slightly dyslexic and often note errors when seeing a post again two hours later, that were "invisible" to me when I knew what the text was supposed to be. My proposed more powerful Strathdearn Pumped-Storage Hydro Scheme has some similarities to the Oroville-Thermalito Hydro-electric Power Complex. The 2 Dams (Strathdearn & Oroville) would be about the same size. The impounded reservoirs would coincidentally be the same volume of 4.4 km3. Both schemes feature a power canal. The Strathdearn scheme could be powerful enough to serve all of Britain's needs for energy storage and the needs of some of our European neighbours too. The UK peak demand is about 55GW but the Strathdearn power capacity could be super-sized to supply up to 180GW - that's plenty for future expansion needs too. The Oroville-Thermalito complex supplies only about 1GW. That's very little in comparison to what Strathdearn could supply. So although the 2 dams - Oroville VS Strathdearn - are roughly the same size and the water impounded the same volume, the flows of water are very much more powerful in the Strathdearn scheme. Although the Oroville Dam is the biggest dam in the US, the Oroville-Thermalito hydroelectric scheme is a modest scheme when considered next to the colossal scale of the Strathdearn Pumped-Storage Hydro Scheme. at a design maximum flow velocity between 10 and 11 metres per second. That is very fast flow - extreme turbulence, large hydraulic shocks, standing waves, etc. Not arguing against it, just wondering if everybody's on board with that. has a red-dotted line which meets the left-hand side at a gradient of about 0.001. See it? This red-dotted line represents conditions of "Critical Flow" where the conditions are just on the boundary between laminar flow at shallower gradients (anywhere below the red-dotted line, or turbulent flow at steeper gradients, anywhere above the red dotted-line. Now the volume flow rate I have modelled - 51,000 m3/s flow - is represented by the vertical blue line. The point on that blue line where it crosses the purple line for flow velocity of 10m/s is a point well below the red-dotted line which corresponds to distinctly laminar flow conditions, NOT "extreme turbulence" as you claim. Ok. Just so the experts have had a good look. Because that hasn't been tested, empirically - that volume of water moving that fast in a long channel. Has it? Plan for biggest-ever Australian pumped storage hydro scheme published. "The need for large-scale storage will only increase and in the future Snowy Hydro could look to replicate Snowy 2.0 to create up to 8,000MW of pumped-hydro storage at this site." interesting that you posted the oroville dam spillway from when it was flowing over its boundaries and eroding the hillside, undermining the spillway. major reconstruction project underway on that. just fyi, BillyT won't be posting further comments. he passed away shortly after his last post on this thread, according to his wife, who posted a notice about that. I made a topical comment at this time on my blog, which I will quote now in case you are interested, to which I had appended the comparison which I posted above between Oroville and Strathdearn, omitting the topic comment. Was it best left omitted? You can decide now! After the Oroville Dam crisis, should we risk new big dam projects? In my opinion, yes, we should risk new big dam projects world-wide. The problem with the Oroville Dam is a poorly designed and constructed spillway system from the day it was built in 1968. The main spillway looks like it has been built using lined-canal engineering – with foundations sitting on the sloped ground underneath being subject to erosion and landslide. So it looks like the spillway has failed in exactly the way a road would fail where a sinkhole has opened up underneath it. The main spillway design should have followed aqueduct engineering practice – meaning built as strong as a bridge with deeply driven pile foundations, highly resistant to erosion and landslides. The spillway design job can be made easier with appropriate choice of route for the spillway – helpful are gentle slopes and bedrock conveniently close to the surface. Looks like the Orville Dam designers took the shortest, cheapest route for their main spillway. There’s no reason to assume that in future, the best project managers would make such a poor job of designing and building our big dam projects. His last post in this thread was in Apr 28, 2015, more than a year before his last post in the forum Jun 11, 2016. 23,000+ posts and presumably of the same high quality as the posts he posted in this thread. What a sad loss to this forum and to science. If I may, I would like to dedicate the remainder of this comment to BillyT? I noticed that BillyT's location was "Sao Paulo", which is in Brazil, South America. I don't know if he lived there for any reason to do with climate or energy science? In any case, I very much appreciated his input to this thread so I would like to re-post the following from my blog which I posted in April and May this year. If it is not appropriate in the opinion of those who knew BillyT better than I then I apologise but I hope it is appropriate and respectful. Put Lake Titicaca for pumped-storage together with the Atacama Desert for solar PV, Patagonia for wind power and the Amazonian etc rainforests for biomass and conventional hydroelectricity and South America would seem to be blessed by natural renewable resources (and therefore riches) which are second to none in the world. If South America can get their political act together and link those renewable energy assets up, they could supply the world energy market very profitably. It would be easy enough to make synthetic fuels from South American renewable energy and ship them all over the world. It would even be possible – now hold onto your hat – to run a 6,000 mile long distance power transmission cable from Lake Titicaca (as the obvious central hub for South America’s renewable energy distribution network) to Europe (the Azores would be a good hub point for Europe and that’s only 4,600 miles to Lake Titicaca) which would mean that the mid-day summer sun in the Atacama Desert could generate electricity that could be transmitted to Europe to heat up people’s homes at about 4.30 pm, just in time for them coming home from work of a winter’s evening. It’s all too good to be true, but there it is – opportunity staring us all in the face! Someone really ought to get on to the European Central Bank, the World Bank and the IMF and tell them that there is this really smart energy scientist from Scotland who has a lot of really great investment proposals that the world’s banks ought to be investing in! Or just appoint me governor of one of those big world banks and I’ll do the investing myself! I had enough good exchanges with BillyT to have learned some of his background. He was born/raised in the US and worked in physics/engineering. He 'retired' to Brazil and took up a new life, including new wife, where he had a small farm. He posted quite regularly on sciforums, which was apparently more of a passion for him than his farm. He was a strong advocate of renewable energies, such as farming sugarcane to produce alcohol (Brazil cars are designed for 100% alcohol fuel). He also was a sci-fi writer, or at least wrote one sci-fi book that he occasionally vaguely promoted on this website.